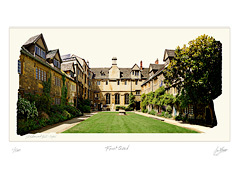 St. Edmund Hall is named after St. Edmund of Abingdon who was an Archbishop of Canterbury in the 13th century. He is said to have lived and taught in a house at the western end of the present front quadrangle when he was a Regent Master in the Arts. 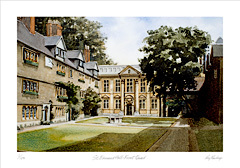 St Edmund Hall was made a College of the University in 1957 but its history goes back to the thirteenth century, for it is the sole survivor of the medieval Halls that provided undergraduates with accommodation and tuition before the Colleges began to do so. Most of the east range is taken up by the Chapel and Old Library which was built in the late seventeenth-century. The mason of the building was Bartholomew Peisley. 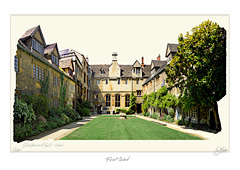 As space was at a premium the two were placed together in a two storeyed block with the Library over the ante- Chapel. The building is five bays wide with Corinthian columns and pediment enclosing the central bay. The doorway is surmounted by a pediment resting on stone-carved books. The Chapel has some glass windows by Sir Edward Burne-Jones and William Morris.